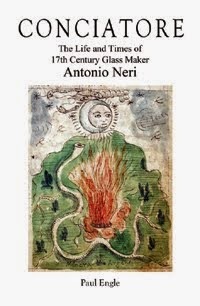 Antonio Neri's career in glassmaking took him from the city of his birth, Florence, to Pisa, Antwerp and possibly other places yet to be confirmed, such as Rome and Venice. Under the reign of Grand Duke Ferdinando de' Medici, a glass furnace at Pisa became an important source of diplomatic gifts in both glass and ceramics. Antonio Neri worked at this facility in the first years of the seventeenth century. Later, the same foundry would receive an order for exceptionally clear glass to be used by Galileo in his telescopes. It is unknown how that particular project worked out, but the furnace master, Niccolò Sisti, made a name for himself supplying glassware to the Vatican, the king of Spain and many nobles throughout Italy and Europe. Undoubtedly, Neri's glass career was strongly influenced by his tenure in Pisa with Sisti.